As I type this, the quilt of which we speak is in the dryer! I’m really excited to see it once all of the fabric once all of the sizing is washed out! I love a quilt out of the wash after I quilt it. The way it gets all crumpled and looks like something you want to cuddle up with on a stormy night while watching your favorite movie. In my case, Malice In Wonderland. However this quilt is not for me, so I digress. 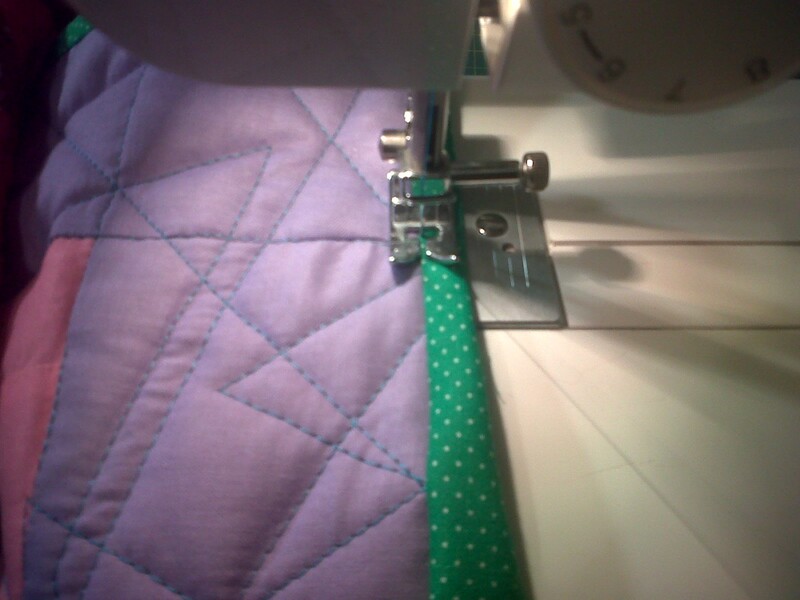 For this quilt I chose to do a bright green binding just to make it more fun, and a little brighter. I was going to do a pink binding, but I think the green made it pop out more and just adds a sense of levity to the quilt. After all, it is for a toddler! Follow the jump to see more pictures!